I recently reported that we are attempting to curate the open melting point measurements collected from multiple sources such as Alfa Aesar, PhysProp (EPIsuite) and several smaller collections. I mentioned that some values - like benzylamine - simply don't converge and the only way to resolve the issue is to actually get a high purity sample and do a measurement. 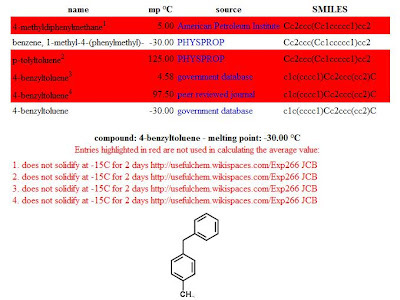 Since that report, we found another non-converging situation with 4-benzyltoluene. As shown below, reported measurements range from -30 C to 125C. The values in red have been removed from the calculation of the average based on evidence we obtained from ordering the compound from TransWorld Chemicals and observing its behavior when exposed to various temperatures. The details can be found from UC-EXP266 (which I performed with Evan Curtin). 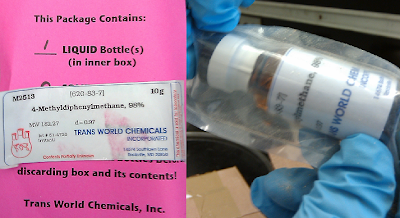 Immediately after opening the package it was clear that the compound was a liquid and thus the 125C and 98.5C values became improbable enough to remove. First Evan Curtin and I dropped the still sealed bottle into an ice bath (0C) and after 10 minutes there was no trace of solidification. At this point, this does not necessarily rule out the values near 5C because of the short time in the bath. 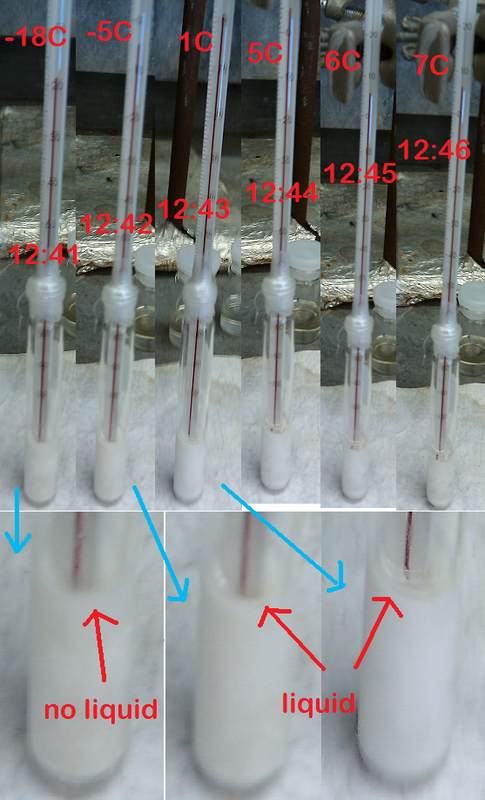 We then used an acetone/dry ice bath and did see a rapid and clear solidification after reaching -30C to -35C. Letting the bath temperature rise it was difficult to tell what was happening but there seemed to be some liquefaction around -12C. 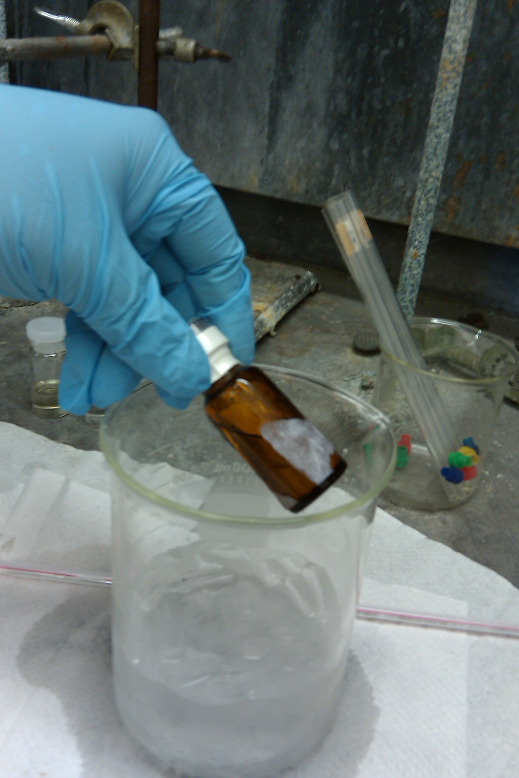 In order to get a more precise measurement, we transferred about 2 mls of the sample into a test tube and introduced the thermometer directly in contact with the substance. 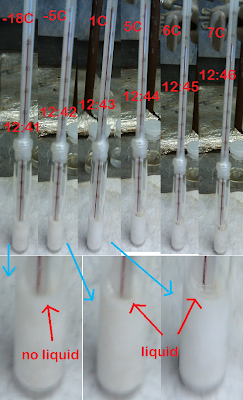 After quickly freezing the contents in a dry ice/acetone bath, the sample was removed and its behavior was observed over time, as shown below. I was expecting to see the internal temperature rise then plateau at the melting point until all the solid disappeared and then finally observe a second temperature rise. This comes from experience in making 0C baths within minutes by simply throwing ice into pure water. As shown above that is not at all what happened. The liquid formed gradually starting at about -9C and never reached a plateau even up to +7C, where there was still much solid left. If we look at the method used to generate the 4.58 C value (Lamneck1954) we find that a similar method was cited - but not actually described there. The actual curves are not available either. However, this paper provides melting points for several compounds within a series, which is often useful for spotting possible errors - unless of course these are systematic errors. In this particular case it doesn't help much because the 2-methyl derivative is similar but the 3-methyl analogue is very close to -30 C value listed in our sources. 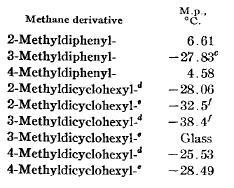 Notice that one of the "melting points" (3-methyldicyclohexylmethane) is not even measurable because it forms a glass. It is easy to see how melting points below room temperature can generate very different values - and very difficult to assess if the full experimental details of the measurements are not reported. Trying to get at more details lets look at the referenced paper (Goodman1950). Indeed the researchers determine the melting point by plotting the temperature over time as the sample is heated and looking for a plateau. The obvious difference is that the heating rate is about an order of magnitude slower than in our experiment. This paper also highlights the fact that there are more twists and turns in the melting point story. 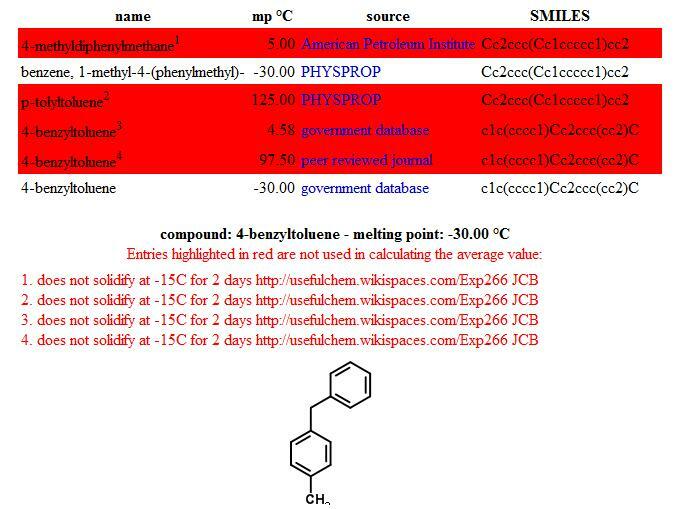 One compound (2-butylbiphenyl) was found to have 2 melting points that can be observed by seeding with different polymorphic crystals. At this point, our objective of obtaining an actual melting point was replaced with trying to at least mark a reasonably confident upper limit. 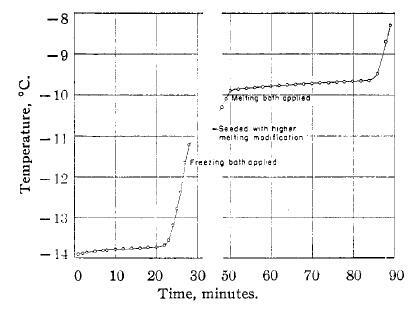 After leaving the sample at -15 C in a freezer for two days, no solidification was observed - not even an appreciable increase in viscosity. For this reason, all melting point values above -15C were removed from the calculation of the average and show up in red. With only the -30 C measurement left, this is now the default value for 4-benzyltoluene - until further experimentation. 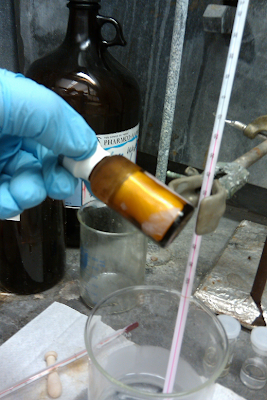 What role do impurities play in your studies? How are sample purifies measured and recorded in your system?